Chris has been with ballwalkpark since December 2012. He originally came on to help me with puppy visits for Lucy, who was at the time, an 8 week old Golden Retriever puppy. 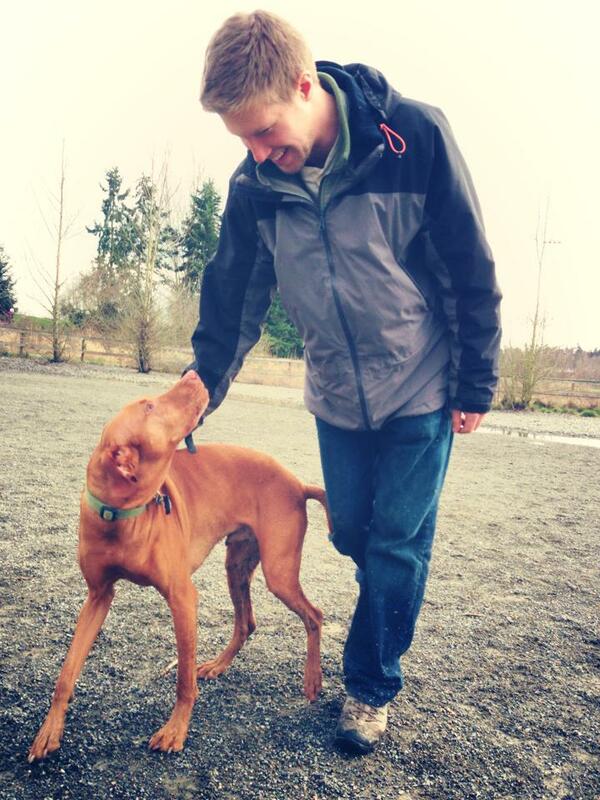 Chris is now taking the majority of the park trips and works with almost ballwalkpark pup on a weekly basis. I met Chris through his older sister, Meghan, who is Bonita's owner. Bonita is a Golden Retriever puppy who I met at 8 weeks old, and she is now 2.5 years old (she is Jambo's cousin, if you read Nancy's profile). Meghan has been a wonderful client and good friend of mine for years. When her younger brother decided to drive across the country and move in with her, I got to talking to him every day when I picked up Bonita. I got a call from Lucy's people about 2x/day puppy visits and I asked Chris if he would be interested in helping for a week or two until my schedule opened up a little. As the weeks went on, Chris began telling me things like he worked in a pet store for years, he fostered dogs, he trained his family chocolate lab and took it to college with him, all of these very relevant things that I had no clue about! On top of that, while I originally asked him to simply walk Lucy and play with her, he began telling me that he was having her sit in her crate and wait to come out of the door, sitting at cross walks, not jumping up, and tons of other obedience things that were way above and beyond what i had asked him to do, but was so grateful he was doing! The more we talked the more apparent his love for dogs became. When I asked him for an update of the day he always got a huge grin on his face and after the typical "she's perfect" response, he would tell me of the numerous adorable things Lucy did that day. Chris was unemployed and sitting on Meghan's couch 90% of the time I stopped by, frustrated with his job search and reluctant to join the cubicle force, so I offered him a job in the glamorous life of dog walking. He is smart, has an incredible innate understanding of dog behavior (in addition to that pet store and fostering experience he didn't bother to mention for the first couple months), is responsible and the clients just adore him. He is a natural with the pack, has them under total control and has a blast while he's doing it. Chris' patience with and understanding of the dogs are really impressive. He has gotten dogs to do things that I didn't even think were possible. He brings a fresh perspective to ballwalkpark and a male presence, which makes more a difference than I care to admit, but the dogs sure do love him! When Chris isn't at the dog park or learning his ways around Seattle streets, he is most likely playing soccer, watching soccer, dreaming about soccer or nursing injuries from soccer. On the off chance there are no soccer related activities going on, Chris could be found reading a book, drinking fancy beer and playing with the Golden Retriever girls in the front yard.